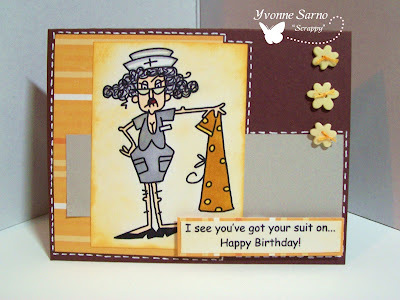 I made this card using one of last weeks freebies from Bugaboo Stamps. I just LOVE this little one! Such a versatile digi can be used for cards apropro for so many events, from New Baby, and Birthdays, -even Christmas! The more I use it, the more ideas pop into my head. Geez, -this cutie might very easily be used for Mother's or Father's day cards too! Since Bugaboo's are so affordable and easy to store in your computer file, you simply can't go wrong in grabbing a few extras to use for even more occasions too! Head over there now and check out all of the amazing images Jodie adds to the STORE each week! You will be so glad you did! If you aren't sure or are new to Digital Stamping, she even offers a FREEBIE every FRIDAY so you can check them out and see how wonderful they are to use! I've heard, it isn't easy being green. 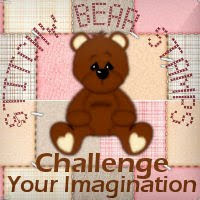 But when you are talking about this week's Challenge on the Bugaboo Stamps blog, it becomes ALOT easier! 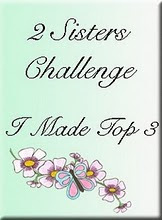 For details on how to join us for our Blog Hop and Challenge go to our blog HERE. 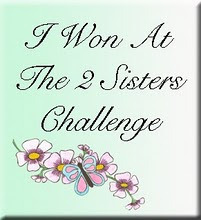 To be eligible to win prizes, you MUST leave your challenge/hop comment for my blog HERE. The card below is another that would fit into the Green Theme this week. 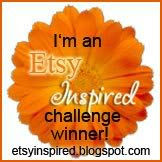 Alas, my card is *not eligible* to win the challenge or prizes, as I am a Bugaboo DT member. But that shouldn't stop most of you...at least not right now! However, Bugaboo Stamps is having their FIRST Design Team Call! Interested? Go to the Catch the Bug Blog to read over the requirements. Maybe YOU will be selected to become a part of our fun and growing design team! Are you feeling LUCKY? Well what RU waiting 4?! Hi there! 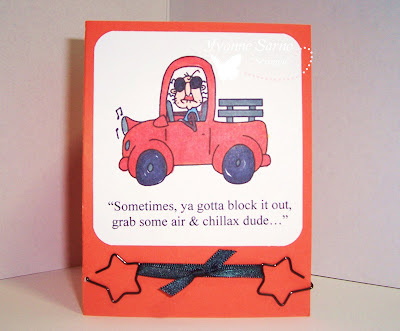 Today's Crafty Ho's Challenge is to make a Single Layer Card. 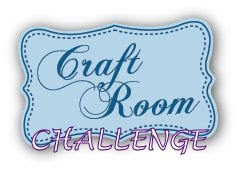 To join in on the fun at Crafty Ho's Challenges, check out our blog HERE, so you can see the rules and link up your own entry! Hope you like my card for this challenge! For my card I decided to make it look like it was matted (even though it is not!) by drawing a black box around the sentiment with a fine point Sharpie! I embossed (- yeah...the powder and heat gun way...not the dry embossed/Cuttlebug way!) using a large floral background stamp from Great Impressions, in order to give the flat card some dimension. 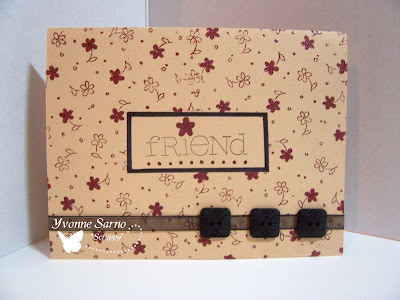 The main image (the sentiment) is from Stampin Up! 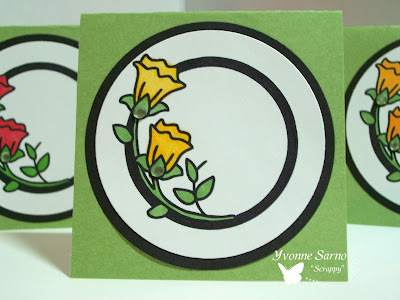 I chose the color palette for my card from CCEE Stampers color challenge. I combined the CCEE challenge with the other challenges listed below. 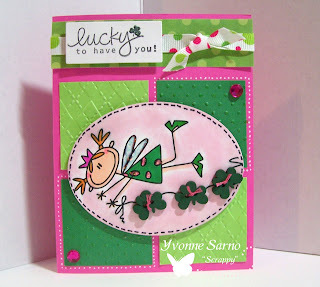 Bugaboo Stamps Blog Hop and Challenge are off to a great start today! 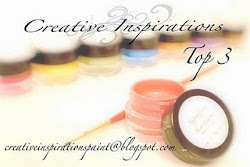 If you are here to participate in the blog hop: You MUST leave your comments HERE to qualify for any of the prizes. 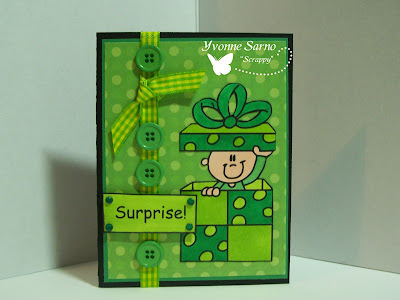 I made this card using Bugaboo's 'Go Green' Challenge Theme. 2nd Bugaboo Challenge post of the day! 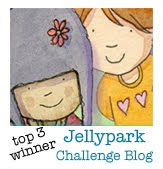 It looks like the Bugaboo Stamps Blog Hop and Challenge are off to a great start today! 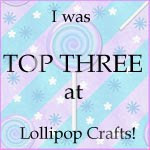 If you are here to participate in the blog hop: You MUST leave your comments HERE to qualify for any of the prizes. 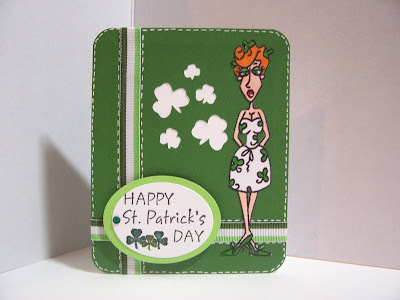 I made this card using Bugaboo's Go Green Challenge Theme. I followed a sketch challenge I found at *(which has now ended) , and combined it with challenges from Lexi's Creations, a friendship themed challenge from Cupcake Craft, a fun color challenge from If the Shoe Fits, a stash challenge from OHStars and Stamps, the Double up challenge from Pollycraft, the Pile it on Challenge, SSDS' Sparkle Challenge, Practical Scrapper's Stamp Challenge, Secret Saturday Crafters Challenge, Tellen's Place Challenge #7, Crazy for Challenges Textures Challenge, Scrappy Frog's challenge yourself challenge, as well as the Crafty Creations Punch/Pop Challenge. 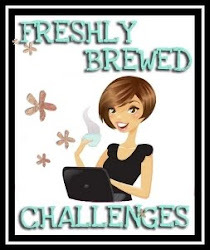 Bugaboo Challenge and Blog Hop! 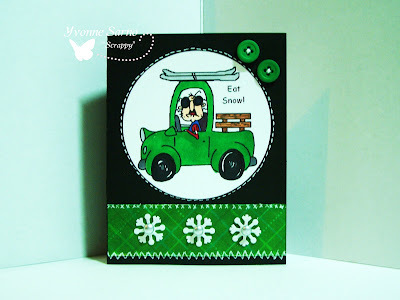 Thanks for joining me today for the Bugaboo Stamps Blog Hop and Challenge. If you haven't just come from Tanya's Blog, be sure to start at the beginning of the hop HERE for a chance at our prizes! This weeks challenge is to 'GO GREEN'. Interpret this as you will, but the Green theme MUST be apparent. Be sure to link your picture of your creation(s) HERE. The challenge will run from 7am EST on Saturday, February 27th and will close at 7am EST on Saturday, March 6th, 2010. We can't wait to see what you create! Good Luck! I love Bugaboo's grouchy guy - Gus! He cracks me up almost as much as his wife, Stella! 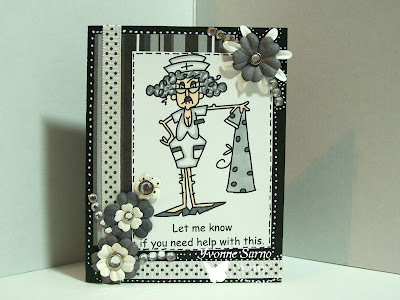 I made this card with this weeks 'Anything Goes' challenge from Lexi's Creations. I've entered several of her challenges (as well as many others) I just love to see what they put up every week! Since I particiapte in so many challenges, I had to put a list of the challenges I entered this card into at the end of this post! Thanks to you all for keeping my creative juices flowing! Final Stop - leave comment at second post!!! 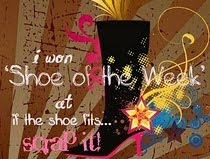 Well it's that wonderful day again -FRIDAY...even better...it's FREEBIE FRIDAY at Bugaboo Stamps!!! Head over there to nab yourself a BRAND SPANKIN' NEW DIGI and check out the new line of SCARLETTS! Here is my card showcasing today's Freebie - Scarlett Scarf! Hope you like it! http://cupcakecraftchallenges.blogspot.com/2010/02/challenge-79friends.html Diamonds are a girls best! 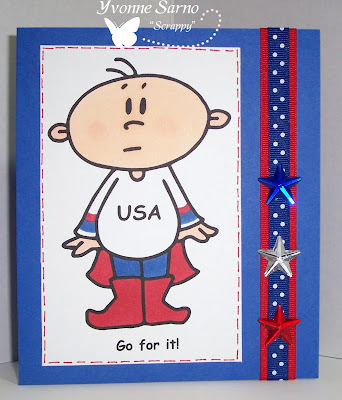 Today is OBG Day at Bugaboo Stamps! That means we feature an old-er Bugaboo digi on our cards or projects! 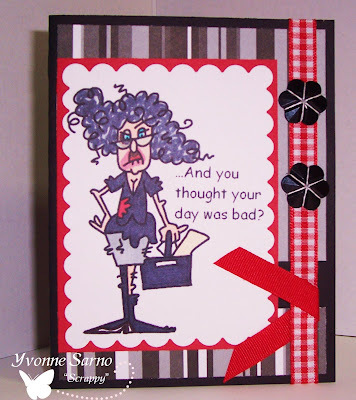 I have heard many comments regarding some of the sassy lady cards I've made, & really appreciate the feedback! However, poor Gus only rarely gets attention or even a mention, & it's making him even grouchier! 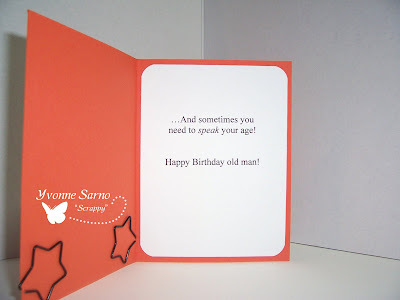 Thus, I've decided to feature my favorite curmudgeon today with this Birthday Card! He's just so grumpy, ya just gotta love him! 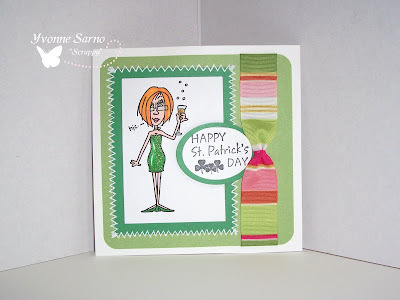 This card features one of Bugaboo Stamps new release Stella's! I used the colors from Stacey's Curtain Call - Act 17 along with Robin Willis' Sketch over at Crazy 4 Challenges. I also combined this with several other challenges as well (see list below). I really love me a challenge! It's so much fun to mix it up though too! Today it is yucky out, but I doubt I'm having as bad a bad as Stella here! Head over to Bugaboo Stamps and grab yourself a Stella or three yourself! She is such a sassy lady that there's no way she won't be able to give you a laugh or two yourself! Monday means it is an ABaC (Anything but a card) Day for the Bugaboo DT. 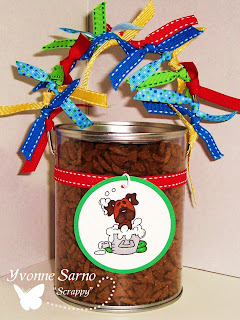 Melissa's Blog features another one of her fantastic projects! Today's featured box is simply gorgeous and super fun too! Don't forget to click the link on her name to check it out! I'll be back later with more to post! I'm in the 'zone' here and feeling pretty creative! WOOHOO! So long as my kiddo cooperates, I should be posting quite a bit more! See ya later! 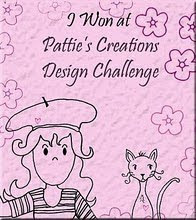 This card is for the 1st challenge on the Crafty HO Challenge Blog since I am part of their new design team! The details for the 1st Ho Challenge are below. I used a stamp from Bugaboo Stamps. 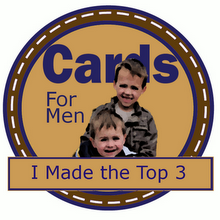 I'm also on the Bugaboo design team and figured a little cross-promo can be a very good thing! Hope you like my card! We are all sick of this cold wintery weather we've been having, so for our 1st challenge we want you to make a card or papercraft project using a Spring theme! 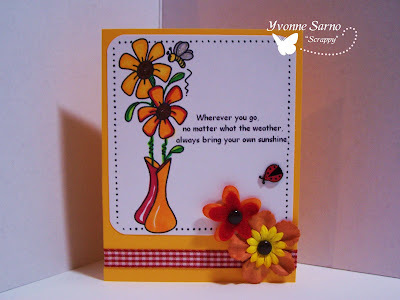 Anything goes - Any Stamps, Colors, Embellies - so long as Springtime is the focus of your work! Hope you enjoy this challenge! 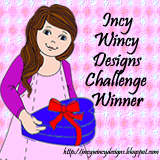 Be sure to link up your project to the CHALLENGE BLOG for a chance to win this weeks prize! I made this card in honor of a friend who has fallen on some difficult times. She is forever in my heart and always on my mind! I am honored to be contributing to this Project RockStar Blog Hop both as a friend and as a fellow HO of Gabriela Arriaza. Paper Makeup has produced this wonderful Digi Stamp drawn by their talented illustrator, Cynthia Liu . I urge you to go over there and grab one for yourself by clinking on the link above! Besides being a super-cool addition to your collection, 100% of the proceeds for your purchase of it and the two sentiments in the collection will be donated to the Arriaza Family. It was an incredibly humbling experience to make a card for someone whose sheer talent you are in awe of. Gabby is such an impressively talented artist in her own right, that is was difficult for me to produce something that I could be proud of in honor of her. 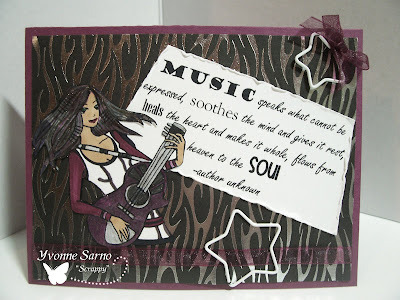 Luckily, this incredible stamp made it alot easier for me to create a card for someone who is a true RockStar! Love ya Gabby-Green-Eyes! Now that you've seen my creation, please hop over to ROBIN'S BLOG, and see the terrific card she has created to honor our lovely friend! I have entered this card into the following challenges in an effort to further inspire people to help the Arriaza Family. I am not an agent of Paper Makeup Stamps, & will not receive any compensation. The latest Bugaboo Challenge is quickly coming to an end is over! Here is another card I made that is fitting for the theme! Click on the names above to see the winning cards! Congratulations to each of our winners! Be sure to go to the Bug Blog to find out how to claim your prizes! I made this notecard set using this weeks 2nd Freebie from Bugaboo Stamps. This elegant design is perfect for so many occasions, and has so many applications. They could be used for gift tags, scrapbooking accents, bookmarks, even as a DP background for your handmade cards! This image is perfect for using up scraps from larger cards, and leftover embellies too. With spring coming (hopefully soon! 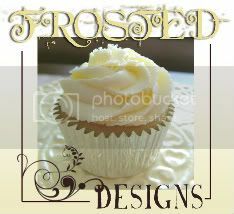 ), they are just perfect for all of those holidays & events from Easter through Mother's Day & beyond! The possibilities are endless! Go nab these for yourself HERE. TGIFF? That's right! 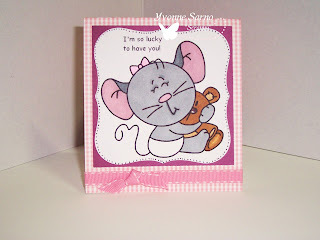 Thank Goodness It's Freebie Friday!This sweet little mousey is from Bugaboo Stamps latest line. 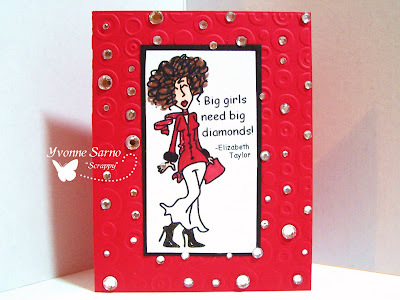 She is one of two free digi stamps available from Bugaboo Stamps! So get on over to *The Bug Shop* and grab her for yourself as soon as it is posted! Then go ahead and check out the other freebie and the two lines they come from! 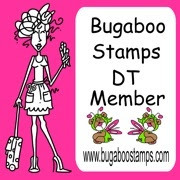 They are awesome, and just a small part of another fantastic line from Bugaboo Stamps! Don't forget, you still have time to get your project(s) in for the Go for the Gold Challenge! For details, to link your entries, & check out the other great entries head over to THE BUG BLOG. Entry deadline is February 20th, 2010 at 7 AM EST. Will you be the winner of one or more of the cool prizes? Good Luck! My daughter, Annabella is obsessed with the Olympics. I mean, TOTALLY FIXATED on them- particularly snowboarding. She knows all of their names, nicknames, the names of tricks, and for some of them, what their injuries have been! My daughter is not even four years old (okay so she turns 4 in two weeks, but I'm still not ready to admit it dang it!) Anyways...since I've finally accepted the fact that I'm apparently not in the loop with 'Snowboarder-ese', I went to google some of what she was saying! In my efforts to know what the heck she was saying, I found some pretty funny terms to use to showcase the last few of my Go for the Gold themed cards!! The Challenge is still open until February 20th at 7am, so you still have time to take part and get a chance at some mad dope prizes. Okay...I'll put away the 'Snowboarder-to-English' dictionary (for now) & someday I can look forward to embarrassing my daughter with this old post! 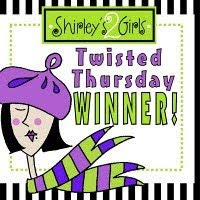 Today is OBG Thursday at Bugaboo Stamps! 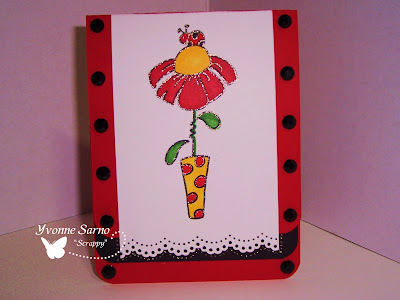 The Ladybug Digi I used for this card is from the Bugaboo Stamps - Vases line. This card is for my friend 'Binny's' DD, Alena. As long as I've known them, I've heard the family refer to her as their 'Laina-Bug'. Now when I see a ladybug anything, I always think of her sweet face! Wednesday's are 'Tutorial Day' for the Bugaboo Stamps Design Team. Today it's RaeAnne's turn and I can't wait to see what she has created to show us! This gal has MAD TALENT -and has been hiding it for way to long! 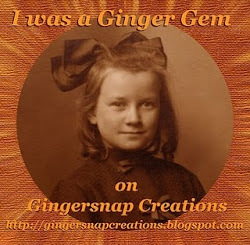 So head over to her BLOG, and take a look! You might learn a thing or three! Don't forget to leave my girl some love in your comments there too! In other news, The Bugaboo 'Go for the Gold Challenge' is still open! You don't want to miss out on a chance on the prizes do ya? Be sure to swing over to the Catch the Bug Challenge Blog to check out the details, enter your cards/projects, and see what everyone has been creating! 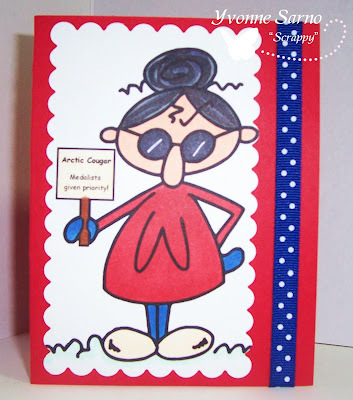 This card using Bugaboo Stamps resident grouch, 'Gus' is another card that would fit the Olympic theme of this weeks challenge. I'm ineligible to win the Bugaboo Stamps Challenge, but it's also perfect for the challenges listed below. Besides, I really don't need any excuse to play with my stamps! Gotta love these Bugaboos! 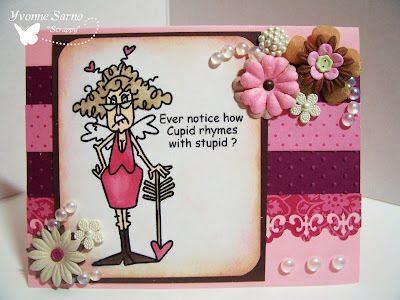 I decided to challenge myself to use several embellishments for this Valentine card featuring Bugaboo Stamps Stella. While I know it's VERY late for Valentines day, I'm sure my friend will forgive my tardiness knowing that I am late for EVERYTHING! Psst...Don't tell, but it's a good thing I have such great friends! I have at least EIGHT more Valentines to complete & post! 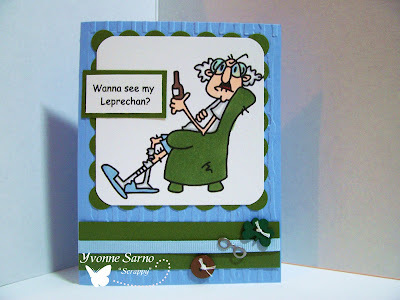 Since Bugaboo Stamps has released TWO new stamp lines, I am delighted to be able to show you a 2nd sample today. This one is an ABaC - Anything but a card. I hope you enjoy it! Another project for the Olympic Challenge? Freebie Friday at Bugaboo! - 4th post!